The official portrait of former Gov. Neil Abercrombie, an oil-on-canvas painting by Maui artist Kirk Kurokawa, was unveiled July 21, 2017, at a dedication ceremony in the Hawai‘i State Art Museum Sculpture Garden. 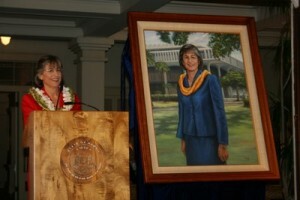 The official portrait of former Hawaiʻi Gov. Neil Abercrombie, an oil on canvas painting by Maui artist Kirk Kurokawa, was unveiled July 21, 2017, at a dedication ceremony in the Hawai‘i State Art Museum Sculpture Garden. 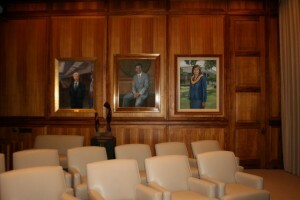 Portraits of Hawai‘i territorial and state governors have been commissioned dating back to the 1912 painting of the Honorable Sanford B. Dole, Hawai‘i’s first territorial governor. Gov. Abercrombie’s portrait is the 18th in the series. Portraits are displayed in the governor’s office at the State Capitol. The 48-by-36-inch painting depicts Gov. Abercrombie standing at the lanai at Washington Place, a position from which he often addressed guests at various official ceremonies and events. The portrait will eventually take its place within the Office of the Governor’s Ceremonial Room at the State Capitol. In the tradition of all governors, Gov. 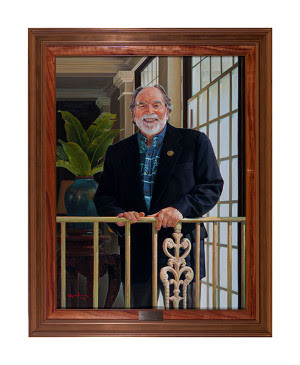 Neil Abercrombie selected the artist and approved the commissioning of the official portrait by the Hawai‘i State Foundation on Culture and the Arts. Forty-six artists from across the United States submitted their applications, which were narrowed to one only after an in-person interview with the former governor. Kirk Kurokawa is a Wailuku-based artists of Hawaiian, Japanese and Chinese ancestry. Born and raised on Maui, Kurokawa is best-known for his portraiture work. His artwork has been included in every installment of the Shaefer Portrait Challenge, a statewide juried exhibition of the Maui Arts and Cultural Center, and was selected to receive the Juror’s Choice Award in 2006 and the People’s Choice Award in 2015. He is a graduate of Baldwin High School and earned a BFA in Illustration from the California College of the Arts. 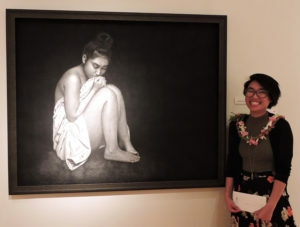 The portrait was funded through the Art in Public Places Program of the SFCA, which receives one percent of the construction and renovation costs for state buildings to integrate art into the built environment of Hawai‘i. The final cost for Kurokawa’s fee, framing, shipping and travel was $38,750.